Local unions once again lived up to the "labor cares, labor shares" motto, as thousands of area members packed the stands last Friday night at Nationals Park to raise money for the Community Services Agency's Emergency Assistance Fund. "Thank you to every union member and local that made our 12th Annual Night at the Nats such a success," said CSA Executive Director Sonte DuCote. "Coming together to support members experiencing hardship shows that our labor movement is alive and well." Members from AGMA, ATU Local 689, Ironworkers Local 5, IUOE Local 99, AFGE, IAFF Local 2068, UFCW 1994 MCGEO, and NoVA Labor participated in on-field ceremonies, from singing the national anthem to calling "play ball." CSA is already gearing up for its next big fundraiser, the 23rd Annual Golf Tournament on September 24; click here for details. (Fall 2017) "Show Some Love" is this year's Combined Federal Campaign slogan, and it was in evidence last Thursday at the US Postal Service Headquarters campaign kick-off, where the Community Services Agency and other charities were in attendance. Postal Service headquarters staff contributed $350,000 last fall and the capital area department-- which includes members of local Metro Washington Council affiliates NALC, APWU and the other postal locals- contributed $450,000. They’re looking to top $1 million this year. “CSA relies on member donations through this and the other work-site giving campaigns to bring vital support and aid to area families in crisis,” said CSA Executive Director Kathleen McKirchy. “Please be generous and ‘Show Some Love’ for your brothers and sisters in their time of need.” Contribute through your worksite campaign using these designation numbers: United Way AND DC ONE Fund- 8253; Combined Federal Campaign- 19579; Maryland Charity Campaign- 9320. Fourteen Building Futures students graduated from their six week intensive pre-apprenticeship program last Monday, June 12, in what was for many students and their families, an emotional journey leading to fresh opportunities in region’s construction industry. The ceremony included dozens of family members as well as instructors and mentors from Operative Plasterers and Cement Masons Local 891 and Community Services Agency staff. Like Turner, Building Futures graduates have overcome personal, economic and professional obstacles that have kept them out of productive career pathways. Over the course of the training, Building Futures staff work with students individually to remove or at least limit these obstacles while students learn essential construction industry skills. The Building Futures program recruits DC residents who are disadvantaged by low income, criminal history and other obstacles to employment. The pre-apprenticeship training combines hands on construction skills training, with construction math, blue print reading, resume-writing and interviewing skills, on the job relationship building and time management, orientation to the construction industry and apprenticeship. The students are very lucky to have access to hands-on experiences at several union apprenticeship programs in the area, and CSA is gratified for the support it receives from the trades. 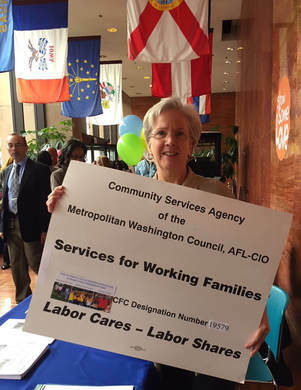 Building Futures is a program of the Community Services Agency of the Metropolitan Washington Council, AFL-CIO. Interested in applying? Recruitment starts now for the summer program beginning July 31st. Applications are due July 18th. Click HERE to download the Building Futures flyer. The Community Services Agency (CSA) has sold more than 4000 tickets so for the Friday, July 28th Labor Night at the Nats. CSA expects to beat last year’s record and sell at least 7,200 tickets. Tickets can be bought individually, but larger group sales of 50 or more get special scoreboard recognition and are entered into a drawing for an autographed Nationals baseball. “This is a fun way for union members and their families to support the critical work of CSA while enjoying some labor solidarity,” said Aaron Bast, Business Manager of Iron Workers local 5 which has purchased 500 tickets for its members. Other leading union purchasers include ATU local 689, IUOE local 99, the United Mineworkers, IBEW local 1200, AFGE District 14, UFCW local 400, IBT 639, IATSE local 22 and AFSCME Maryland, Council 3. Tickets are just $15 each. Proceeds go to support CSA’s Emergency Assistance Fund which is dedicated to providing direct emergency financial assistance to union members in need. To order tickets, email Kathleen McKirchy at [email protected], or call 202-974-8221. The spring Building Futures program began Monday. A program of the Community services Agency (CSA), Building Futures began in 2007 to help DC residents in underserved communities learn entry level skills and certifications for careers in the union construction trades. The CSA runs four classes annually with approximately 20 students per class. Students are trained at the Plasterers and Cement Mason’s union, Local 891 facility in northeast where they will earn certifications in Occupational Safety and Health (OSHA 10), CPR and First Aid/AED, Flagger and Scaffold User. Students also receive case management support to help remove obstacles commonly faced by disadvantaged workers including issues surrounding child care, resume writing, math improvement and interviewing and presentation skills. “For Building Futures students, our program is a first step into a stable, rewarding pathway to good union work,” said Sylvia Casaro-Dietert, who coordinates the program. - photo: Job Developer Consultant Tia Watkins provides a program overview on Day 1; report/photo by Matt Losak, CSA Asst. Exec. Dir. 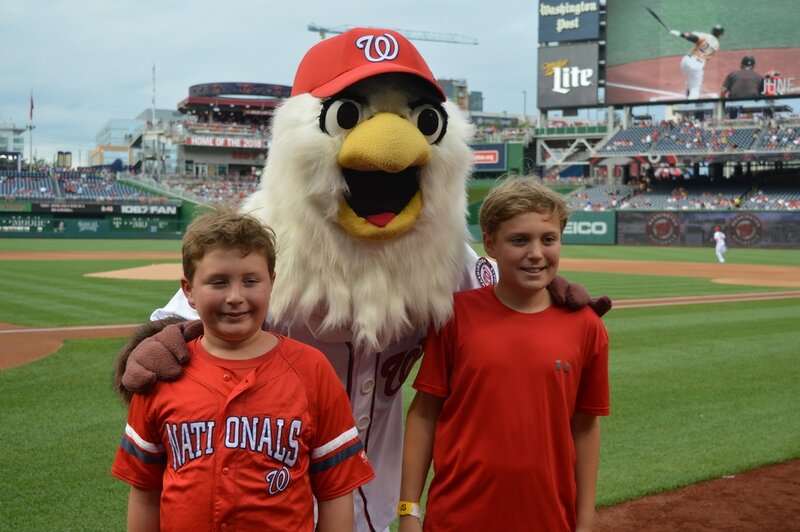 ​Labor Night at the Nats ​Ticket Sales Brisk with more than 1500 sold! Click here to download the flyer above. The Community Services Agency helps hundreds of workers and their families every year but only because of the generosity of local unions and their members. As we head into the colder months, that support is needed more than ever. Make a direct donation: give securely online by clicking here now; no contribution is too small or too big! Forward this widely to co-workers, friends and family: solidarity works! Post this on your local’s website and circulate on social media. Invite a speaker from CSA to address your executive board or union meetings this fall while the United Way, DC One Fund, CFC and Maryland Charity Campaigns are running. Contact me at 202-974-8221 or [email protected]. YOU make the difference: “Labor Cares - Labor Shares” Thank you for your support! Click here for a checklist of activities YOUR union can do to help sustain CSA. With your help this year, we had 15 adopted needy families, 10 food drives providing food baskets for 30 families, $1500 donated which provided gift cards to 35 additional needy clients, and lots of wonderful holiday cheer spread around in our community by the labor movement! Thank you for all of your hard work and generosity to help us make this program a success! If you or anyone who worked with you needs a tax deduction letter from CSA, please let me know names, amounts and where to send and I’ll get those out right after the holidays. THANK YOU! Your support of this effort is most genuinely and sincerely appreciated! We wish you all the happiest of holidays. (December 12, 2012) Without the Building Futures (BF) Pre-Apprenticeship program “I would not have had the opportunity to become an electrician,” BF graduate Lisa Kenner says in a new video (below) produced by the IBEW's media department. The Community Services Agency’s program “pretty much built my future,” Kenner adds. “They built the bridge for me to advance to where I want to be.” Other BF graduates explain how the program changed their lives in the 3:35-minute video, which the IBEW produced as part of its United Way campaign ("IBEW Leads United Way Labor Division," UC 11/29/2012). “It’s so important that people contribute,” said CSA’s Client Services Coordinator Sylvia Casaro Dietert.